With a sub 6 second 0-60mph time thanks to electric augmentation, the BMW 740e iPerformance PHEV is hardly a hybrid for the benefit of the environment. Power is derived from the pairing of a 111hp electric motor and a 255hp combustion 4 cylinder, with total combined outputs of 322hp. All-wheel drive is standard, and the only gearbox available is an 8-speed automatic. The 740e’s electric range is 14 miles, and a full charge takes at best, 2.7 hours. The Driving Assistance Package is a worthwhile option, comprising a heads up display, blind spot monitors, and forward collision avoidance. Those in the market for a BMW 7 Series are hardly the ones looking to rack up fuel savings by means of electric augmentation. 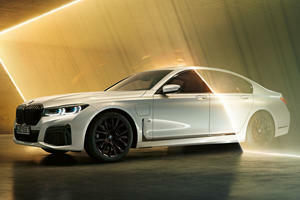 So the 7 Series Plug-in Hybrid, dubbed the 740e xDrive, forming part of the PHEV ‘iPerformance range’ from BMW would seem to be more about bragging rights – pairing electrified performance with bold efficiency claims and the premise that, though you may be wealthy, you still care for the environment. Pairing a 9.2kWh battery pack with a 2.0-liter turbo combustion engine, this is perhaps best described as luxury with a clean conscience. 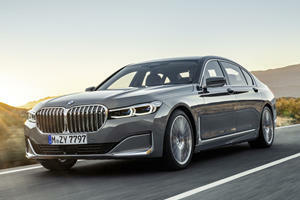 Electrified or not, this is still a BMW 7 Series. 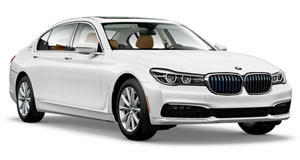 That means it includes all the luxury appointments you’d expect from BMW’s halo model luxury sedan. Plush leathers and a variety of inlays such as wood and aluminum adorn the cabin’s surfaces, with a definitive lack of harsh plastics. The cabin is light and airy and affords massive amounts of space for all occupants. The 14-way power adjustable heated leather seats are supremely comfortable, aided by standard four-zone climate control. Rear occupants are treated, not just to the extra zones of climate, but to masses of head and leg room. Both front and rear occupants have sunroofs overhead, and those lazy enough to not close the doors completely will be glad to know that power closing doors are standard. Though trunk space is generous, the battery pack mounted under its floor impedes cargo volume and limits it to just 14.8 cubic feet. Air suspension and selectable drive modes are standard for the 740e xDrive iPerformance. As such the ride is as plush as to be expected from a luxury car of this size, soaking up imperfections and filtering out ruts and cracks imperceptibly. At the push of a button, the adaptive suspension firms up to offer high levels of support and athleticism that belie the sheer size of the 740e iPerformance. With that said, this is no Jaguar XJ; it’s not an involving driver’s tool no matter how much the systems may try to feign it. 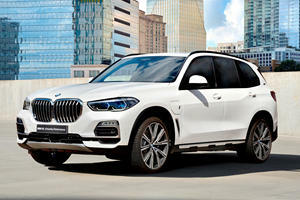 BMW has lost their edge in making involving driver’s cars of all sizes, and the 7 Series is the latest victim. The performance is there from the hybrid drivetrain, but the feel isn’t. The electronically power-assisted steering system offers ample weighting in various modes, but overall lacks feel and feedback. The front end feels blunted, and though adept, this is just a luxury sedan and nothing more. Hybridization has many benefits. In addition to a claimed 64 MPG equivalent rated by the EPA, and a 14-mile pure electric range, there’s also the hit of electric torque. A 111 horsepower electric motor with 184 lb-ft of torque combines with a 2.0-liter turbocharged 4 cylinder engine (255hp, 295 lb-ft) to develop combined maximum outputs of 322hp and 369 lb-ft. Power is sent to all 4 wheels via the exceptional 8-speed ZF automatic gearbox. 0-60mph takes a claimed 5.1 seconds, and a full charge of the 9.2kWh lithium-ion battery takes 2.7 hours in ideal circumstances. In addition to the aforementioned interior amenities, the 740e iPerformance also comes standard with a power trunk lid, adaptive LED headlights, and front and rear park sensors. A standard 10.2-inch iDrive infotainment system features both rotary and touch control options, and boasts available gesture control too. Adding options quickly drives the price skyward, though the available luxury is plentiful with options like a heads-up display, massaging front and rear seats, and semi-autonomous driving available. The 7 Series hasn’t been crash tested, but available safety features include a night-vision camera, automatic emergency braking with forward collision alert, and lane keeping assist. The 7 Series is no longer the driver’s choice of large luxury sedan. But with the 740e iPerformance plug-in hybrid, it’s a technological tour de force that pioneers future technologies in a car available today. BMW has compromised on its heritage, but technophiles and millennials won’t give a damn when this sort of tech is available. The refreshed 745e plug-in hybrid limousine boasts the Stormtrooper look.